Ooh, I love fairy tale retellings! I’ve never read this one, and it sounds like it’d be the perfect book for me. I’m definitely adding it to my to-be-read list–thanks for the great review! When you do get around to reading it, let me know what you think! I’ve had this on my bookshelf for a while and you just reminded me. Thanks..Can’t wait go get into that & Shannon Hale’s ‘The Book of a Thousand Days’. Oh yes, I wholeheartedly second this recommendation! Lyrical is the perfect word to describe Shannon Hale’s writing, and her world-building and characters are fabulous too. This book’s on my favorites shelf! Wooo! So glad to find another person who loves this book as much as I do! Honestly, i really don’t know WHY it took me so long to finally pick it up! I guess I was thrown off by the cover (which looks very young… but I loved plenty of books with covers that appeal to younger audiences, like ELLA ENCHANTED. I’m glad I finally got past that and picked it up anyways). And I LOVE Shannon Hale’s writing! I haven’t read this, but, oh boy, do I want to now! Great review, V.! I adore this book. I’ve read it several times and it’s on my list of books that I really need to buy soon. It’s one of those books that just makes me happy! I LOVE owning books that I can reread again and again. I think that’s when you know a book has really stuck with you – when you find yourself picking it up again and again. I’m SO GLAD that you like it as much as I do! Due to my love of fairytales/retellings, I bought this a while ago, and it’s been sitting on my shelf for a while. This may have convinced me to read it next! Thanks for the rec. I actually haven’t read BOOK OF A THOUSAND DAYS – although that book is next after I finish reading the rest of the books in this series. Not only is The Goose Girl good, but each successive book is totally wonderful. I think Forest Born (the most recent) is my favorite although admittedly I had almost forgotten that the series started with a fairy-tale retelling until I was reminded recently. I’m so glad you enjoyed it Vanessa and I’m so excited for everyone who will read this now because of your recommendation. I am loving ENNA BURNING right now! And I’m just so glad, knowing that once I finish it, I have 3 more books in the series to read! 😀 I think one of the best feelings is finding an author who is this awesome, and knowing that you have a bunch of books of theirs to read! Oh my gosh, this has to be one of my most favorite books of all time. Shannon Hale can make words into magic, and her lyrical style is just enchanting. I was totally blown away after picking this up randomly at a book fair one day. The writing is so beautiful, but the plot, the characterization, twists, fairytale roots, everything is so wonderfully done. I can’t stop praising it haha. Hope you enjoy the rest of the books in the series! I kind of dislike the new covers, but the other books are still pretty good. 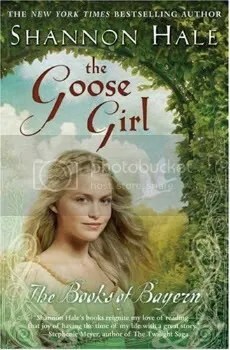 (Forest Born is a close second for me, but The Goose Girl just seems miles better in my opinion). Sorry for all that text, but seeing a review like this for such a good book is irresistible! Don’t you just love randomly picking up books, and then having it become an absolute favourite? It’s one of the best feelings – when you go into a book without any expectations. And yeah, I don’t really like the new covers – I’ve seen the old covers, and I think they’re much more whimsical and fairytale-esque. That’s one of the downfalls of falling in love with a series after it’s been around for a while, I guess! And omg, I love gushing about awesome books! 😀 So feel free to gush as much as you want!